Not long after releasing the Xperia Z5 Compact in Europe, Sony today started selling the larger Xperia Z5, too. However, while the Compact can be bought in several markets, the Z5 is available only in the UK (for now). Carphone Warehouse is the place where you can currently buy an Xperia Z5 in the UK. The handset can be purchased SIM-free for £549.99 (about €742, or $830), or on contract, starting at £41.99 per month. There are four color options to choose from: black, white, gold, and green. As you probably know, the Xperia Z5 is the successor to the Z3+ / Z4 from earlier this year. It's got a dust- and water-resitant body, sports a 5.2-inch 1080p display, and runs Android 5.1 Lollipop. The Z5 is powered by an octa-core Snapdragon 810 processor, also featuring 3 GB of RAM, 32 GB of expandable internal memory, and a 2900 mAh battery which, according to Sony, can provide up to 2 days of usage time. One of the highlight features of the Xperia Z5 is its 23 MP rear camera with fast auto focus, SteadyShot image stabilization, and 4K video recording. It's not yet clear when (or if) the Sony Xperia Z5 will be released in North America, but we're going to let you know when we find out. At&t is your only savior when you want to get it thru contract. Other US carriers only know apple and apple. Sony need the US market to pick up sales. They have the best device of 2015, they should market it hard. I currently have a Z3 so although i really want to get the z5, I'm the kind of guy who likes to change things up so for me it's either the Z5 or the Nexus P6. I'd better pass on this and get the delicious LG V-10. That one is too good for me and closest to perfect. Still waiting for more real world battery and performance tests and maybe some drop tests before I decide on buying it. The Z5 has the best camera in a smartphone. Same here, though not much about drop tests. 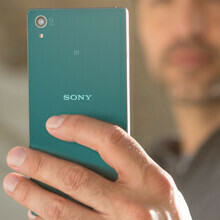 Sony phones have been known for their great body built. I sure hope it becomes available in North America as I'd like to try one. Whether or not bringing these phones over will help their profits is another question. cloveuk have £457 with free bluetooth speaker. There are two kinds of Droids: cheap crap and overpriced crap. This one belongs to the latter. A droid is a verizon exclusive android device. If your going to insult a OS atleast know the name of the OS you are insulting. Compared to flagship prices in Europe, this isn't expensive at all. Loving that Green color btw. Why don't more phones come in blue, red, green or similar colors instead of pink? And if they come to US at all they are carrier exclusives. dammit come to Indonesia ASAP. beautiful design. I just can't see that price $830 holding up in the US market. I certainly wouldn't spend that much on a handset. Hey PA where's DXOmark results about Xperia Z5's camera?